Modern plant pots are the setting for an aesthetic appeal and set a benchmark of the style of the place and provide an immersive look. These are available in different materials around such as most common ones being made of clay, fiber glass, wood, concrete and plastics. But, recently, the trend of stainless steel flowerpot is making the industry go wild and have captivated the audience into its sleek appearance. It is now common to find them both indoors and outdoors and are being replaced with traditional plant pots. Also some of them are placed specifically for the ornamental plants. Stainless steel planters and plant pots are now available in various sizes, different materials and unique shapes. The nature’s bliss are provided with a noble look with some serene and indisputably stainless steel planters. Hence, planters made up of stainless steel flowerpot are not only exquisite in nature but also extremely stylish in appearance and have an easy care and maintenance. These sleek flower pots being made up of stainless steel are resistant from corrosion and rust and are in fact virtually indestructible. It makes them a perfect material for designing the flower pots and carving out great designs that suit the location and the ambience of where they are placed. The stainless steel flowerpot is prepared by a meticulous process where the stainless steel sheet is cut and then welded and then the surface is brushed again being especially at the welding edges. 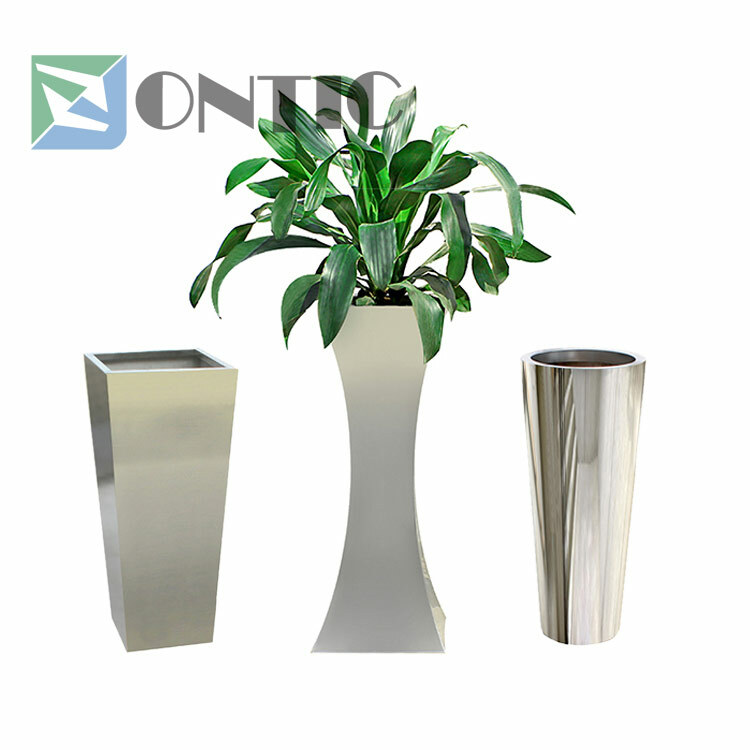 Large stainless steel flower pots are basically stationed in the hotel foyers, offices and entrance areas and verandas. Hence, they create an elegant ambience and perhaps make it more appealing while grabbing attention to the plant inside. The high class V2A stainless steel excels in durability and has a very bright and shiny appearance is usually used in planters. Available in different shapes, colors and sizes. Although these metals can be lightweight and don’t hold much bearing upon the surrounding, they are surrounded with some issues just like all the other materials. Choosing an appropriate stainless steel quality is important as cheap models can rust out and be dented. But being lightweight these stainless steel pots make the process of planting and moving the pots easy and more practical. These wonderful stainless steel flowerpots are now found across various online platforms and have various other additions and features apart from just being a static aesthetic object. Some of the recent stainless steel flowerpot can now be found to have LED illumination and other features such as displaying directions and acting as support material. Hence, stainless steel flowerpot although on the expensive side have many positives also which makes it a very viable and feasible option to consider. Also, the market for steel pots has been increasing with great capacity.